Mount Usher Gardens are privately owned gardens laid out along the banks of the Vartry River in Ashford, County Wicklow. Designed in the Robinsonian style, they measure 20 acres and contain around 5,000 different species of plants and trees. 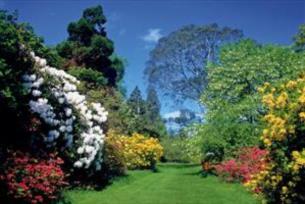 Dating from the 1860s, Mount Usher Gardens in County Wicklow are one of the top-rated garden attractions in Ireland. Operated by Avoca, an Irish family-run lifestyle and catering company, the gardens feature a variety of plant species and trees including rhododendrons, magnolias, camellias, eucryphia and shrubs. Designed in the wild Robinsonian style, Mount Usher Gardens feature water as an essential part of the scenery, with cascades and suspension bridge visible from many sections. Winding paths lead visitors on a journey through groves and glades and on to the river banks. A collection of Eucalyptus trees and a hidden fern walk are just some of the features that will delight old and young alike. In addition to the beautifully landscaped gardens, Mount Usher offers a full menu of locally sourced ingredients in the Avoca Garden Café, as well as a shopping outlets in the nearby courtyard, which are open all year round. With ample car parking, Mount Usher Gardens are the perfect family destination within easy reach of Dublin.